Pattern baldness affects approximately 70% of the male population by the age of 35. It rises to 85% by age 50. However, it is not just men who experience this problem; women suffer through thinning hair as well, especially with the constant use of heated elements. Fortunately, some of the best experts in hair restoration made it their mission to solve this ongoing problem. They aimed to develop a way to halt the hair thinning process and promote re-growth of lost hair follicles. The product they created has turned the hair growth management industry upside down. Introducing the Laser Comb. No Heavy Battery Packs To Carry Around. 7 Medical-Grade Lasers (No LEDs). Promote Hair Growth In Both Men And Women. If you haven’t heard about the effectiveness of laser therapy against the onset of hair loss, you’re in for a treat. We are only going to review the best laser comb on the market; the most superior brand in the hair re-growth industry is HairMax. When you think Laser Comb, think HairMax. It is the only FDA Approved laser comb on the market, standing head and shoulders above the competition. Trials indicate that it is excellent at combatting hair loss and stimulating hair growth. For those reasons, we rank HairMax LaserComb as the best laser comb for 2019. The HairMax LaserComb is the ultimate device for clinically proven hair regrowth. More physicians recommend it than any other product. If male pattern baldness runs in your family, or if you are experiencing thinning hair at a young age, it is a good idea to start HairMax LaserComb treatments before the signs of hair loss begin to show. Preventative measures are always better. The device is powerful and built to last, made with the safest components. In addition to this, it is lightweight and portable; very convenient to tote to the gym or in a carry-on bag when traveling. Research and trials show that using HairMax LaserComb regularly can reap impressive results. If you have seen someone’s hair thicken and grow in since you have known them, chances are they have used the HairMax method. Based on clinical studies, using this product for over three months is successful in 93% of cases. An additional 129 new hairs per square inch have been scientifically observed after constant use for both men and women. If these statistics have made you want to know more about HairMax LaserComb, and whether it is the right hair loss and regrowth product for you, then carry on reading. HairMax LaserCombs took over two decades of research and development to bring to market. Laser therapy has been used for many years to treat skin problems and get rid of tattoos. The developers at HairMax spent a long time harnessing this treatment to make a safe and effective method for hair loss. The device delivers nourishing laser light to the hair follicles which stimulates them at a cellular level. Instead of follicles shutting down and being subject to hormones and stress levels, they use the laser light energy to stay healthy. This reverses the hair thinning process and restores natural hair growth. There is ample evidence that the technique works, with dozens of before and after photographs available. However, the most significant proof of the process working is the fact that HairMax has moved over 1.5 million laser devices worldwide. A safe and effective hair growth routine that works has taken the industry by storm. Additionally, the HairMax LaserComb has eight FDA Approval clearances and seven independent clinical studies. It is recognized worldwide as an internationally licensed medical device and has been acclaimed in six medical journals. 1.Do Laser Combs Really Work? The use of low-level laser therapy (LLLT) to eradicate problem areas has been a tried and tested health/wellness technique for years. It combats pigment build-up, strengthens skin, and lessens the depth of wrinkles. It has proven safety and effectiveness when used as a hair loss treatment method; the condition is that the instructions must be followed. As it is a non-invasive treatment, as opposed to aggressive ones like hair plugs, it is subject to the personal criteria of each user. It stands to reason that a non-smoker who frequently exercises, follows a nutritious diet, and uses the device precisely as instructed will get better results than someone who doesn’t. Some users gain such significant results from the HairMax LaserComb that it is as if the tool is precisely what their hair needed to spring back to life, thicker and stronger than ever before. Across every user group, however, there was always a positive response when the product was applied in compliance with the directions; proof that the HairMax LaserComb works. 2.Is HairMax LaserComb Safe to Use? There have been absolutely no adverse side effects reported from using the HairMax LaserComb when appropriately used. In the 30 years that LLLT has been used in the health and wellness industry, there as never been any concern over side effects. It is FDA Approved, after all. There have been decades of clinical research into the treatment to ensure it is comfortable and pain-free, which is why it fits perfectly into any grooming and maintenance routine. 3.How Much Will These Lasers Set You Back? 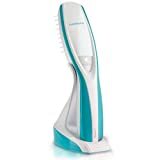 There are two HairMax LaserComb options: The Ultima 12 LaserComb costs $395.00 on Amazon, while the HairMax Prima LaserComb costs $299.00 on Amazon. Both designs are clinically proven hair growth devices, cleared for use by both men and women. Either of these LaserCombs would be the perfect choice to address your unique concerns with thinning or damaged hair. HairMax is the recognized pioneer and undisputed world leader of laser hair regrowth technology that can be used in the convenience of your own home. 4.Which Shampoo Can Be Used Along with Laser Combs? HairMax has developed the Den•Si•Ty Hair Care System to complement LaserComb usage. When used in tandem with the device, the shampoo nourishes the scalp and hair follicles, injecting essential minerals and vitamins into the problem areas. This maintains the health of the hair follicle and promotes strong, luxurious growth. 5.How Long Does Laser Hair Therapy Take to Work? You’ve heard of the saying “Good things come to those who wait”? In most cases, it takes about three months to see any signs that the HairMax LaserComb is working for you. Evidence of improvements can show sooner than this, but according to the instructions, the average wait time is three months. If you want even more opportunities to use HairMax devices to treat your balding or thinning hair, you should look at their RegrowMD Laser 272 BioLight Comfort designed caps and LaserBands. The cap can be used when you don’t have the time to spend at your home in front of the mirror. It can be used in the car driving to work, while exercising, cooking, you name it. It looks just like a standard cap, except it has the Regrow LLLT secretly hidden inside. The LaserBands are specifically developed for easy use at home so you can get out and about doing your daily chores while it targets the areas on your scalp that are most prone to hair loss. In summation, the HairMax LaserComb is the leader in hair loss prevention and hair regrowth technology. It is safe and effective for both men and women. We strongly advise that you check it out if you have been affected by hair loss for any of the following reasons: use of medications, poor nutrition, stress, illness, or hereditary factors. You will quickly benefit from starting this system of hair loss prevention. Don’t let the threat of hair loss frighten you. If you are looking for the best laser comb for 2019, HairMax LaserComb is a safe way to crack down on further hair loss and promote strong, healthy regrowth. The prices of the devices is very high. The margin of profit is probably in the multiple 100% ‘s. Why not drop the price, and make even more profit as the volume of units sold will be fantastic. Really, volume sales due to drastic price reduction a better strategy simply because hair loss is better than starving or skipping the purchase of heart medication. I hv been using it since one month. When I start it.. I get an headache n it remains full.day.. even when I m.moving the comb.. I start feeling slight swelling type sensation in the scalp or brain .. god knows..
Also.. getting joint pains… N weakness I.e. loss of energy ..
Are these all related.. ? I have this product and I love it, I used it like it said 3 x a week and I did saw a lot of baby hair growth in 3 months of using it, I just did not saw more because I stop using it because at that time I was looking to move so my time and stress did not help me to continue the treatment, I was looking for a house to move and packing stuff and working full time but I just starting again and will continue this time. What is the life span of the built-in battery in HairMax Laser Comb although it can be recharged when placed on the stand and plugged on a power point ? If replacement is needed Is the built-in battery available in stores? At what cost?